Plastic Gift Cards are available in more than 40 beautiful designs and have a polished, high gloss finish - the same quality, size, and thickness as a credit card (30-mil). 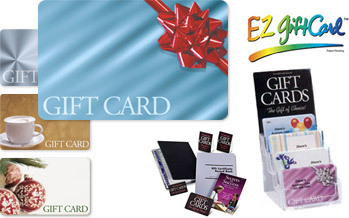 Unlike other gift cards, EZ Gift Cards require no electronic equipment or software and no point-of-sale fees. Complete system includes gift cards, envelopes, security labels, clipboard, and record book. FREE promotional kit includes a marketing handbook, display rack, window decal, and table tents.